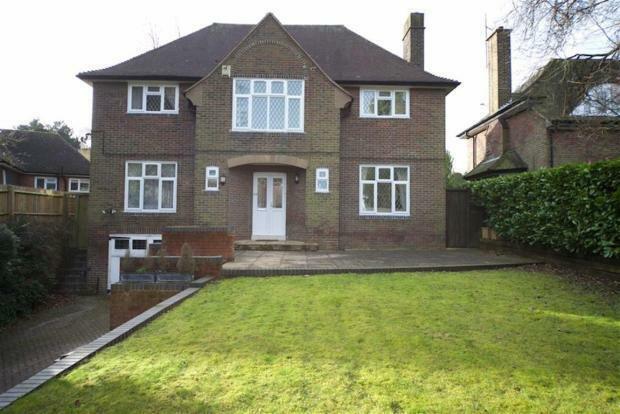 4 Bedroom Detached House For Sale in Luton for Offers Over £650,000. Situated on the prestigious Whitehill Avenue in the very popular South Luton area is this rarely available chain free four bedroom detached family home that features an enormous rear garden in excess of 100ft. This property has been a family home for many years and the time has come to pass this property on. The property offers a wealth of accommodation and includes a basement cellar that spreads across the whole property, three reception rooms, fitted kitchen/breakfast room, ground floor cloakroom, stunning galleried split level landing, luxury fitted corner bath suite and en-suite shower room to master bedroom followed by three further double bedrooms. Externally the property features a large mature rear garden offer further potential to extend/develop and a large driveway to the front for several cars. Whitehill Avenue is a sought after picturesque Road situated to the South side of Luton and houses mainly individual traditional detached properties. Ideally located within walking distance of the Town Centre amenities that include Luton Mainline Railway Station, providing 'Thameslink' services into London's Kings Cross, the M1 Motorway (Junction 10) is a matter of a few minutes drive away. Low flush WC. Pedestal wash hand basin. Full ceramic tiled walls and floor. Window to front elevation. Double panel radiator. Double glazed sealed unit window to rear elevation. Double glazed sealed unit French doors to rear patio. Wood laminate flooring. Leaded light glazed door to kitchen. One and a half bowl sink unit with mixer taps and cupboard under. Further range of wall and base units providing ample granite work top surfaces. Alcove for range cooker. Central island with breakfast bar and granite surface. Plumbing for dishwasher. Tiled splash backs. Tiled flooring. Radiator. Leaded light window to rear and side elevation. Leaded light glazed window to front elevation. Balustrade. Wood laminate flooring. Airing cupboard. Radiator. Access to loft space. Radiator. Leaded light double glazed window to rear elevation. Fitted shower with screen door. Pedestal wash hand basin. Low flush w.c. Full ceramic tiling. Ceramic tiled floor. Extractor fan. Leaded light window to rear elevation. Two built in wardrobes. Radiator. Wood laminate flooring. Radiator. Leaded light window to front elevation. Picture rail. Wood laminate flooring. Bedroom 4 3.63m x 3.2m (3.63m x 3.2m). Radiator. Built in wardrobe. Wood laminate flooring. Leaded light window to side and rear elevation. Luxury corner bath with multi functions. Vanity wash hand basin. Low level w.c. Full ceramic tiling. Ceramic tiled floor. Heated towel rail. Leaded light style window to side elevation.